Last fortnight’s Turnbull Stakes provided us with two things – Winx’s 28th straight, and a pretty handy form guide heading into today’s 141st running of the Caulfield Cup. Chris Waller trained Youngstar was already one of the favourites prior to Tuesday’s barrier draw, but after drawing gate nine, May’s Group 1 Queensland Oaks winner drifted onto the second line of betting at $6.00 with Ladbrokes. This mornings news of a Soft (5) track downgrade looks to suit the four-year old though, who hopes to become the first mare to win the $5 million feature since Jameka in 2016. Youngstar, who finished runner-up behind Winx in the Turnbull, has placed in two of her three starts this Spring, but more importantly, has shown nice form on the sticky surface over the course of her two-year career. Out of multiple Group 1 winning Irish stayer High Chaparral, Youngstar has recorded three career wins on the Soft surface already. 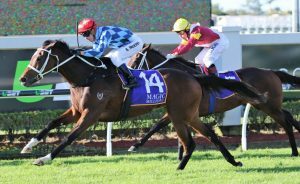 Most notably, her win over 2200m in the Queensland Oaks at Doomben back in May showed she love the wet, which was followed up by a third placing in the Queensland Derby (2200m) on the Heavy surface a fortnight later. With jockey Kerrin McEvoy on board, it’s likely the pair will have to race from a two- wide position on Saturday. For McEvoy, it’s been ten long years since he won the Cup on All Too Good in 2008, but he admits Youngstar’s strong start in the Turnbull has him feeling pretty confident. “It was a great run in the Turnbull, we obviously loomed up and at the furlong I was thinking ‘geez where’s Hughie’ and I couldn’t hear Winx, or see him, but I let go with a nice finish and we only got beat by two lengths by the great mare Winx, so that’s a good form line coming in” McEvoy said. As for Saturday’s run in the Cup, Youngstar’s first step-up to the 2400m journey poses a few challenges, but again, McEvoy thinks that might be a positive. “The Oaks win, she was strong at the end of it there in Doomben, and she’s got a great attitude that relaxes well. She’s a nice mare to ride in the way that she conserves her energy, so you’d like to think that 2400 will be no problem” McEvoy said. For Waller, he too hopes to claim a piece of history on Saturday – his first ever Caulfield Cup win. The champion trainers best result was Royal Descent in 2013, who finished fifth. Funnily enough, rival trainer Darren Weir chimed in on Youngstar, admitting she will be tough to beat on Saturday. “I’m not confident we can beat her home,” Weir told RSN when asked on Cup favourite Kings Will Dream’s third place run in the Turnbull.